Thanksgiving is officially 22 days away! YUM! I can’t wait to get the Butterball turkey and all the fixings. Even though I am on a diet, that won’t stop me from enjoying some of the best food I will eat for the holidays (that’s Thanksgiving and Christmas). The generous PR folks for Butterball have offered MDG readers a Butterball Turkey Giveaway! 1 of our fabulous readers have the chance to win a Butterball $20 gift check! Did you know that Thanksgiving is the only major holiday without an emoji? Emoji’s are suppose to spur excitement for the upcoming holiday, so this year, Emoji fans can visit Change.org to sign the petition and do their part to make the Thanksgiving emoji a reality. To help spread the word, the Turkey Talk-Line experts banded together to create a heartfelt appeal for signatures which can be found on Youtube, Facebook and Twitter. Butterball conducted its first-ever consumer survey this year and found that three in four Thanksgiving preparers agree: Thanksgiving doesn’t have to be perfect! As long as loved ones are together and the turkey is tasty, the festivities around it can be as imperfect as ever. Despite the overall positivity around the holiday, first-time millennial preparers are still feeling the pressure. Eight in 10 first-time cooks worry about cooking the turkey correctly. This number drops among experienced preparers, but still 43% worry about getting it right. Although the Butterball Turkey Talk-Line experts have heard every turkey question possible, experts are making it easier to get cooking help this Thanksgiving by offering the ability to text cooking questions for the first time. Additionally, new video tips will help with all of your Thanksgiving needs. 24/7 Text Help: Whether you have years of experience or it’s your first time cooking the turkey, Butterball has all the answers you need. You can now text their Talk-Line experts at 844-877-3456, for all the insider tips to celebrate your perfectly imperfect day…no matter what the circumstances! Holiday cooking text help will be available starting Nov. 1, with extended hours starting the week of Thanksgiving. How-To Videos: The Butterball Turkey Talk-Line experts have been answering turkey questions for more than 30 years and have helped almost 50 million cooks. Now their expert knowledge is available at your fingertips day or night with fun and helpful video tips for those preparing holiday meals, available at Butterball.com or YouTube. Website and Mobile App: Whether you have years of experience or it’s your first time cooking the turkey, Butterball.com and the Butterball Cookbook Plus App have all the answers for your needs. Between coupon savings, trusted recipes, how-to-videos with step-by-step details and key tips for success, everything you need is easily accessible. Expert Advice Anytime, Anywhere: The help doesn’t stop there. The Butterball Turkey Talk-Line has evolved how they help cooks and are able to provide expert advice anytime, anywhere. Facebook and Twitter: Help is available through the Butterball Facebook and Twitter pages with tips, special savings and more. Pinterest: Find Thanksgiving recipe inspiration for your holiday celebration on the Butterball Pinterest page. Instagram: Follow Butterball on Instagram to get a behind-the-scenes look, recipe development for our Thanksgiving meal and more. 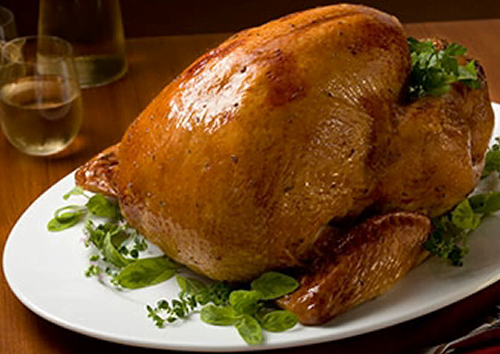 Live Chats: Engage with turkey experts through Live Chats on Butterball.com during November and December and receive real-time suggestions and advice. Email: Email Butterball using this form and receive helpful tips right to your inbox. 1-800-BUTTERBALL (1-800-288-8372): Turkey Talk-Line experts will be available this season starting Nov.1 through Dec.24, 2016, to answer questions and assist all Thanksgiving cooks. We are happy to offer this Butterball Turkey Giveaway! 1 lucky winner will receive a $20 Butterball vouchers to use towards the purchase any ButterBall Products! Giveaway will run from 11/1 – 11//08 at 11:59 PM CST. This giveaway is open to US residents only. You must be 18+ to enter. Modern Day Gramma is NOT responsible if the winners email ends up in your spam mail folder. It is suggested that you include mediainfo@moderndaygramma.com to your contact list or check your spam folder on November 9th and 11th so you don’t loose out! Good luck and gobble gobble! Check our other Giveaways Here | Check out more Reviews HERE | Check out our Holiday Gift Guide Here. The use of cornbread stuffing is a tradition in our family. We always watch the Macy’s parade! Edye recently posted…21 Quotes For Every College Student! Our family tradition is to go to my aunt’s house every year! I work and my fiance makes the dinner. We have a lovely night of hanging out with our cat. No stress. We go to my moms house and have the whole family there for thanksgiving. Since the kids are grown it varies, but my favorite is to have everyone together for a day of catching up on our lives and having a meal together, with all of our favorite dishes. The usual I guess….just get friends and family together for a big turkey feast. We get together with my sister in law and her family. We stay in our pajamas on Thanksgiving day! We all go around the table and each of us says what we are thankful for this year. I love making homemade goodies with my family like rolls and chex mix and then all of us sitting down to eat together. We all eat together and watch the football games. Our traditions primarily focus on the food. We still used my maternal Grandma’s recipes even after she passed away. Her stuffing is still my favorite. We always on Thanksgiving cook as a family and then we sing to the radio and laugh because none of us can sing. There are so many but the one we never miss is the homemade Irish soda bread. The recipe has been passed down 4 generations. One of our Thanksgiving holiday traditions was enjoying my grandmother’s cornbread dressing with our roasted turkey. We cook Thanksgiving dinner together every year.